Here are the notes for today’s Hotfix! Fixed spooking bug for the Park Ranger so that animals are no longer spooked when at a great distance from the vehicle. Fixed a bug where the Park Ranger could be placed in PB and WRR. Fixed so that Pointer Dogs can now track Reindeer with Tier 3 Detection active. A possible fix for dog spawning issues in multiplayer was released earlier in the week, and initial feedback is positive. Because we are unable to consistently reproduce this bug on our side, please let us know if the issue continues to be a problem. Thank you for all your bug reports to date. We now consider the issue fixed until further notice. Fix to Dall Sheep horns visual bug. 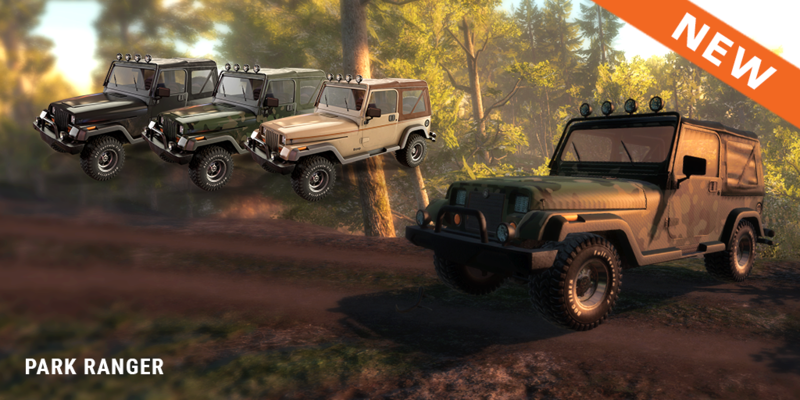 New Vehicle – Park Ranger in 4 variants, namely, Beige, Black, Army and Stallion. Added Gasoline in 3 different packs. 100, 50 and 25 unit packs. 50 unit pack is given to all members at the start of every session. Dramatically lowered spook radius for the Recurve Bows, Cable Bow and Longbow. Scent Hounds that have lost their track will be able to track again from their last found clue, even if it’s not a blood clue. Whitetail Deer on Whiteheart Island shouldn’t spawn everywhere. 1. Enable Chat which hides/shows in-game chat messages. 2. Vehicle Camera Auto-center which toggles the camera auto positioning itself while driving the Park Ranger. Multiplayer settings to set if the vehicle can be used by everyone, the host only or just disabled entirely. “Toggle minigame” in the keybind settings menu has been renamed to “Show Huntermate Apps”. Moderately improved damage of the Crossbow Pistol. Alt-Tab issue should be resolved so that you don’t disconnect. Fixed insanely high spook radius when shooting Crossbow Pistol. Fixed the inability to aim after exiting tripod while reloading. Fixed Sambar and Rusa Deer walking in a straight line both while being nervous and afterwards. Fixed an issue where Dall Sheep would sometimes freeze in place while idling. Fixed a minor issue with Feral Goats which caused Bushrangers Run to load slower. The Drilling Rifle can now be used with tripod rest. Fixed radio in the Rustic Trophy Lodge. Fixed being able to use the sunglasses effect even after un-equipping them. The temperatures have plummeted here now, and that rain that I talked about a few weeks back, has turned to a light sprinkling of snow. 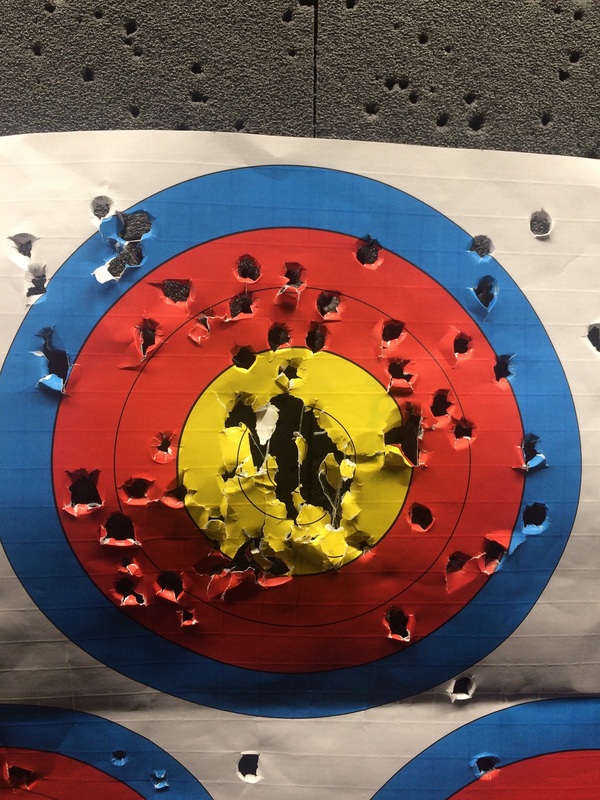 I have been practicing as much as I can with my new bow and starting to feel smoother, more comfortable and starting to get better groupings. This was one of the three targets I was shooting at last night and about ⅓ the way through, I decided to just focus this one, so I could better see where my groupings were going, this was at 20yards/18m. One of the instructors thinks I should get a longer stabiliser, as I just have the small factory one on it. I am still watching ‘The Land of the Free” series, after last week’s video I will try and keep them a little less controversial. I was trying to show that it depends on what you are using and how you use it. Any weapon used correctly can be ethical and any weapon not used properly can be unethical! This weeks video is a bit of an eye opener… shooting ducks mid air with a bow, i’ll let the video do the talking, enjoy! Remember this shows real hunting footage, so if you prefer to keep your hunting fix virtual, DO NOT CLICK Here. 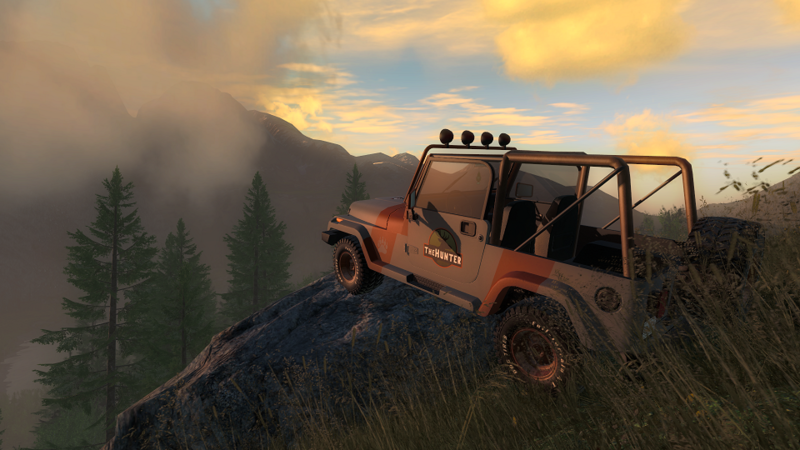 Today, after nearly 10 years of theHunter: Classic, we introduce the first form of motorised transport the ‘Park Ranger’! The Park Ranger comes in three different colour variations, which can either be purchased in a bundle or separately. We do have one more skin that we have decided to make a little more exclusive, ‘The Stallion’. This can be acquired by either winning competitions where it is offered as a prize, or purchasing a 6 month membership license. For one week only, as a special release offer, you can obtain one of ‘The Stallion’ Park Ranger variations by purchasing a 6 month membership. This offer runs up to and including Wednesday the 5th of December. The Park Ranger needs fuel to run, but if you are a member, you get 50 units of fuel free each time you start a hunt. If you do not have a membership, or want to drive for extended periods of time, you can purchase fuel in the store. It can not be damaged or get flat tires. If you have a little disagreement with gravity while driving it, or submerge it under water, you will be injured and forced to fast travel back to a tent or lodge. If you press ‘J’ you can access the Vehicle Menu which will give you three options. ‘Tow Vehicle’, ‘Locate Vehicle’ and ‘Lock Passenger Seat’. If you manage to get it stuck you can use the ‘Tow Vehicle’ option, it gets returned to your backpack and can be re-deployed on a nearby road. If you can not remember where you left your vehicle, you can use the ‘Locate Vehicle’ function, which will make the Park Rangers horn sound, this will not spook any animals. The final option ‘Lock Passenger Seat’, is used to keep unwanted players from getting in your vehicle. This leads us nicely into how they work in multiplayer. As the host of a multiplayer game, you can select if you want them in your map or not. This is done in the options when creating the game. There is a limit of two Park Rangers in any multiplayer game. If you spook an animal while driving, you will need to wait until it has calmed down before shooting it, any animals shot while spooked from the Park Ranger will be registered as an unethical harvest and you will get a letter from Doc. When spotting an animal, if it is still spooked from the vehicle, you will get notified at the bottom of the spotting information. Pressing ‘H’ while driving will honk the horn and this WILL spook animals. The Park Ranger will not be able to be used if you have a competition activated. So, would you like the chance to win this rare Park Ranger variation? All we want from you, is a nice screen shot of the Park Ranger, posed as if it were in a car advertisement! Post it into our forum, in this thread here. Photos cannot be altered using any editing software, but feel free to add any text that you think might help to ‘sell it’. Three of these variations can be won, competition closes Monday the 10th of December, 9am CET and the winners will be selected shortly after that. Well the voting has ended and with over twice as many votes as any other calibre, the new rifle is going to be chambered in 7mm-08! We have some more news as well, this rifle will be released with two different ammo loads and you can expect a wider ethical list. 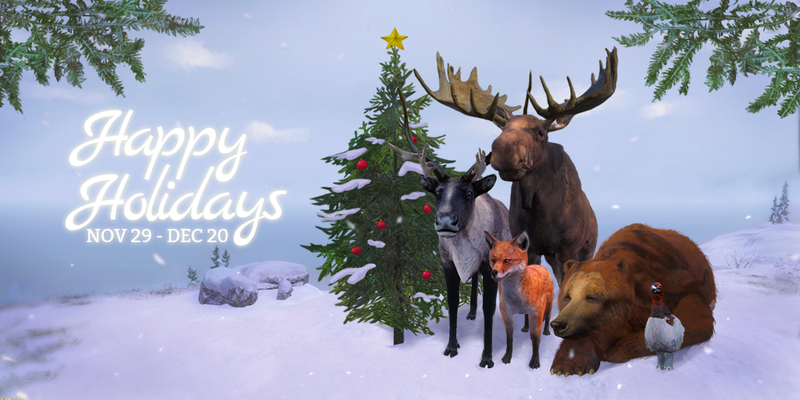 Tomorrow our 2018 Holiday Event starts, more details will be released in our forums tomorrow, so make sure you head over to check it all out! The ‘Trophy of the Week’ is this HUGE Rocky Mountain Elk! It was shot by ‘Rosete’ and scored a massive 427.795! Look at the size of those tines! 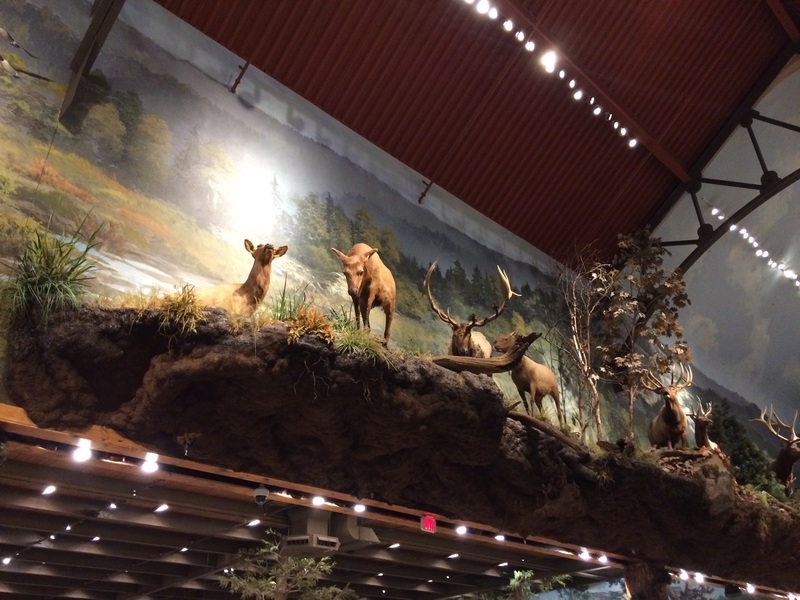 If you are not sure what many consider a trophy Rocky Mountain Elk, it is any that score over the 380 mark! The ‘Rare of the Week’ goes to ‘Gostwind’ for this Leucistic Rocky Mountain Elk, it made the Super Rare Gallery with a score of 374.33, congratulations! A very nice Trophy! This week Blacktail Deer and Black Bear are free to hunt, Red Feather Falls is going to be busy, good luck! This week I am still deep into ‘The Land of the Free” series, but I did get funneled to this video which I found interesting. Hunting Black Bears with spears, after watching it and when a spear is used like this, there is no question in my mind that they are ethical. I guess it’s like any weapon though, you have to use them correctly! Remember this shows real hunting footage, so if you prefer to keep your hunting fix virtual, DO NOT CLICK Here. Thanksgiving 2018 is underway! 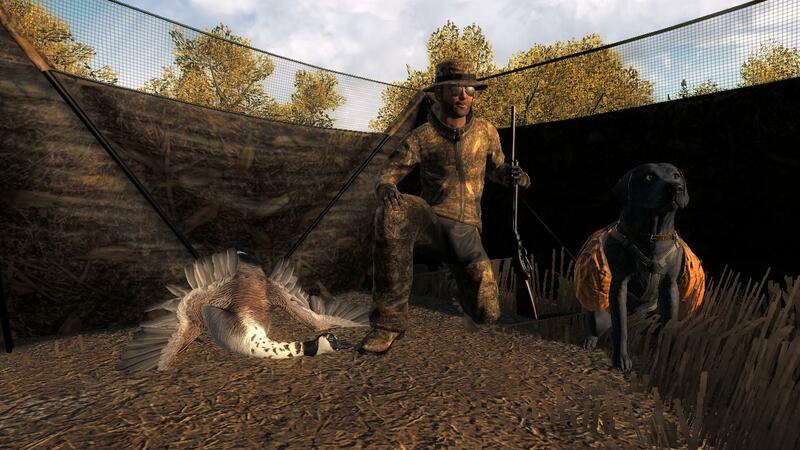 This year we have tiered Turkey Competitions and a nice Mission pack. The Competition is “Turkey Overload” and the average score of your five top scoring Turkeys is your competition entry! Each tier awards the top 10 players, so there is a good chance at getting some prizes. All week long, there is also 2x XP for all animal tracking and spotting, so if hunting Turkeys is not your thing, you still benefit! The event wraps up 0300 CET, Monday the 26th of November, so make sure you don’t miss out! SOME SUPER IMPORTANT INFORMATION, PLEASE READ!!!!! 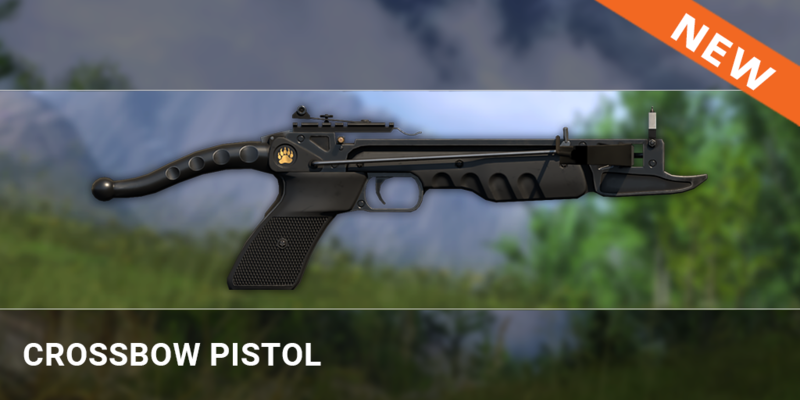 So originally we had 4 options to vote from, and one of them was the 7mm, which would have been the same 7mm ammo that is in game at the moment. However, the 7mm option was removed and replaced with a 7mm-08 round, which IS NOT THE SAME as the 7mm round that is in game currently. We have reset the poll, to make sure the votes are still accurate and we have also left the poll open, which means you can change your vote. The 7mm-08 round, would be completely new in game and have a different ethical species list, compared to the 7mm. The list is not finalised yet, but if it is the winning calibre, it will either have a light grain round and be ethical from Fox to Red Deer (maybe Rocky Mountain Elk, but not Roosevelt, due to the size difference). Or if it has a heavier grain bullet, it would be ethical from Coyote to Elk. Now if you are wondering what all this is about, In December we have our next ‘Advanced Firearm’ coming out, ‘The Scout’. This rifle will feature a folding bipod that is built into the front of the stock and deploys when the player goes prone. While prone it will provide extra stability, but to balance that out and add to the realism, the side to side movement will be a little more restricted. So what is the competition and why are we mentioning this rifle so early if it is not due out till December? We want you as the community to select which calibre it should come out in, to vote, head over to our forums and select one of 4 options. If you leave a comment with a brief description as to why you picked the calibre, that will enter you into the draw to win one of three ‘Scouts’, when they do get released! Pretty sweet deal right? Make sure you join myself and Graham tomorrow on stream, as we will be turning the key on the new Vehicle! www.twitch.com/expansiveworlds 4pm CET! 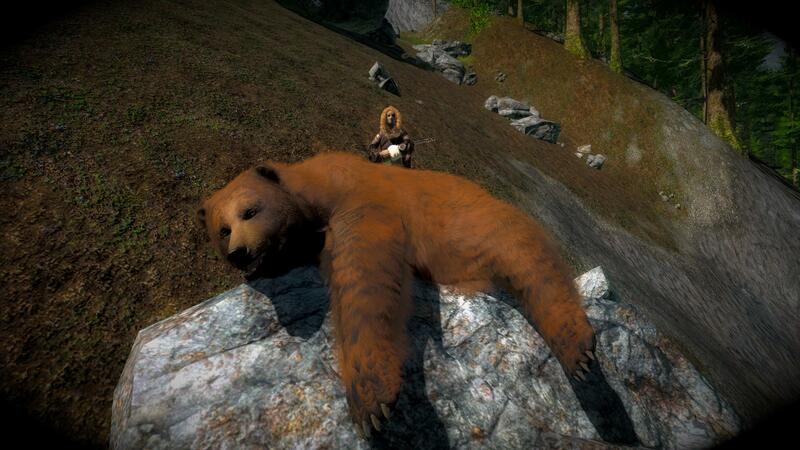 The ‘Trophy of the Week’ is this HUGE Brown Bear! It was shot by ‘Dilaj’ and scored 28.858! Great use of camera angles and hunter position, to really make this look big! If you are not sure what many consider a trophy Brown Bear, it is any that score over the 27 mark! The ‘Rare of the Week’ goes to ‘Oskar4358’ for this Bald Leucistic Canada Goose, congratulations! A very nice Trophy shot. 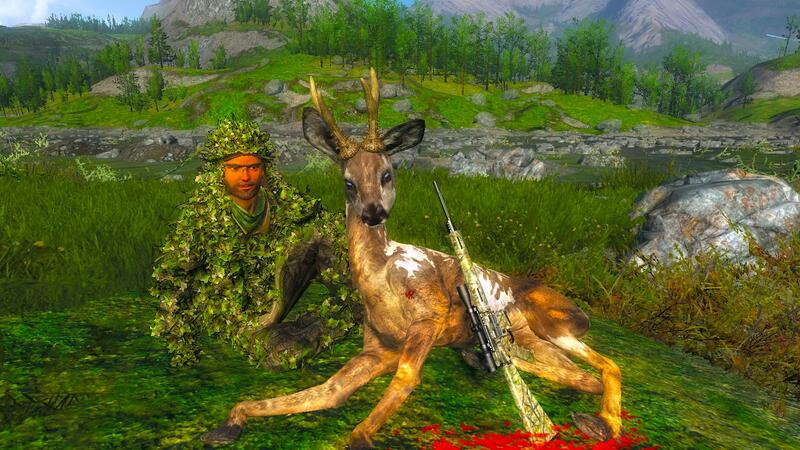 This week Turkey and Roe Deer are free to hunt, good luck! I hope everyone is having a good week, all going to plan my week is going to get even better. 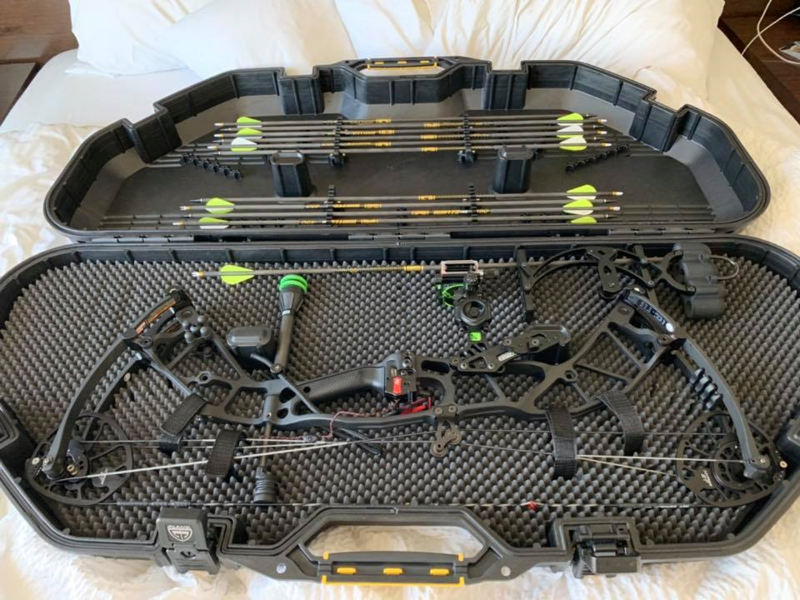 This Saturday I am getting out for a hunt here in Sweden and then on Sunday, both Graham and I have our archery safety introduction at the local archery club. 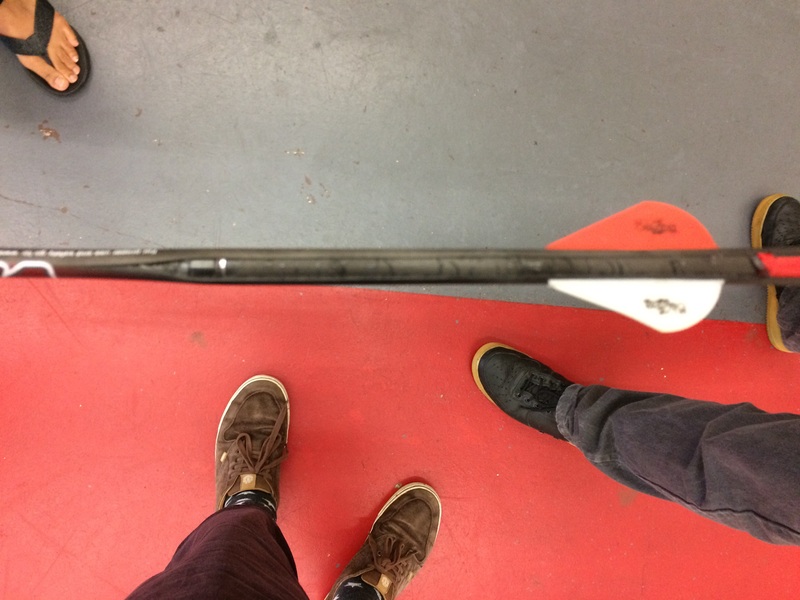 Which means (touch wood), we will have somewhere local to let arrows fly whenever we want. Now, I am still watching the ‘Land of the Free’ series that I linked last week, as they have just started their second season and a new episode comes out every day. Their videos are awesome and if you are a US resident, they have some amazing prizes to be won, so get amongst it! But, if perhaps they are not your cuppa tea, today’s video suggestions are the ‘Hushin crew’. They are also making some good videos and worth a watch. I have to say thanks to user ‘thewindow’ for the suggestion. Remember these show real hunting footage, so if you prefer to keep your hunting fix virtual, DO NOT CLICK Here. Today we have released the Crossbow Pistol and you can now pick it up in the store. This lightweight Crossbow can be carried in your ‘Small Weapon Holster’ and is perfect for small game. There is also a red dot scope that is available for it and it makes aiming a lot easier. The scope can be found here and the Crossbow Pistol can be found here, enjoy! As is traditional when we release a new weapon, there is a competition to go along side it; so make sure you sign up and test your skill! Thanks so much to everyone that participated in the survey, we had over 1770 responses and once we go through the data, we will share some of it with you all! The winner has been selected and emailed, so please check your inboxes and spam folders for more details on how to claim it! 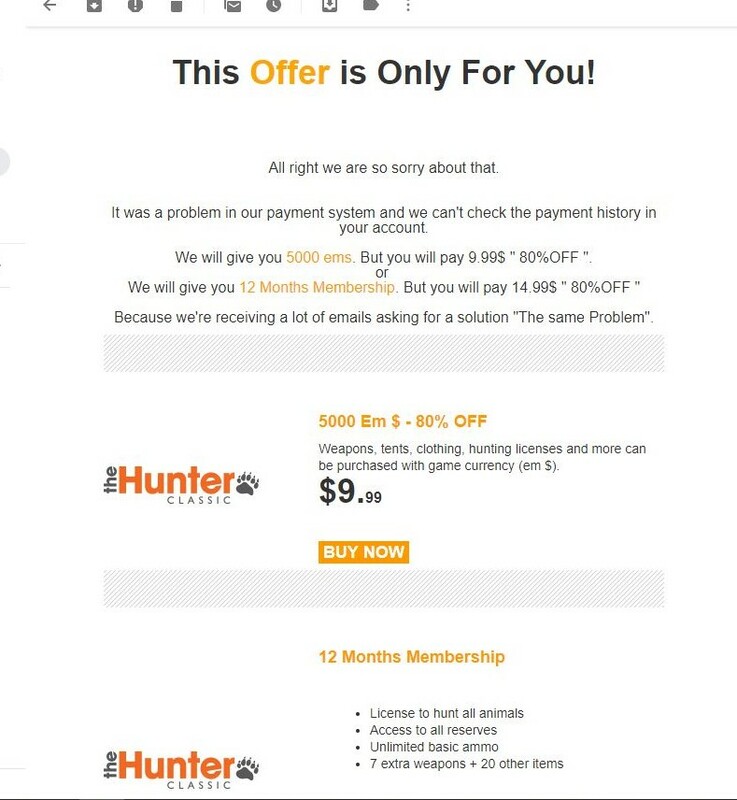 We have had a little influx of questions regarding some email offers that people are receiving. The image above is from the email address [email protected]. THIS IS A SCAM! Do not under any circumstances interact with this email address or any of the ‘Free em$ hack’ videos you might see on YouTube. The only email addresses we use are either ones from @avalanchestudios.se, @expansiveworlds.com or @thehunter.com. These scams ask for your account details and your password and you will lose everything. We WILL NEVER, EVER, EVER, ask you for your password and you should not give it to anyone, ever. Do not accept anything from an email address that is different to the ones mentioned above. If in doubt, contact myself or send an email to [email protected] We can verify anything for you. NEVER GIVE YOUR PASSWORD OUT TO ANYONE, this goes for anything on the internet. We are going to contact Google about the account, but sadly they will probably just make a new email address that is similar. So the best action is just to make everyone aware, stay sharp! Due to a company wide meeting, the stream tomorrow is canceled. We will however be back next week. The ‘Trophy of the Week’ is this HUGE Water Buffalo! 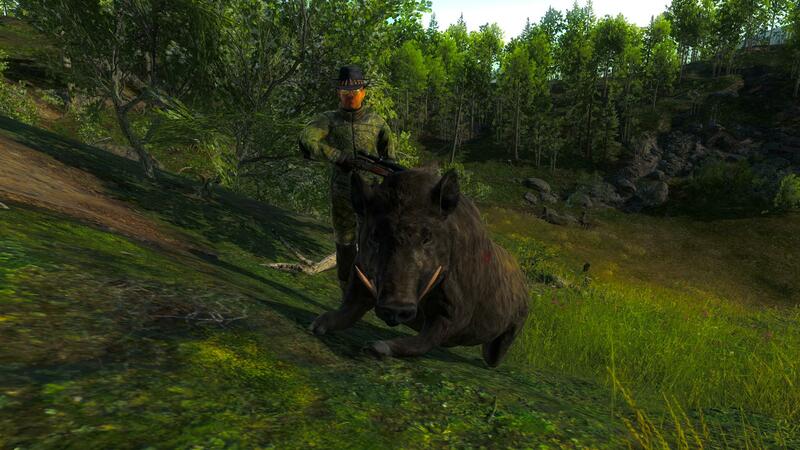 It was shot by ‘BigGameHunter_21’ and scored 285.699! 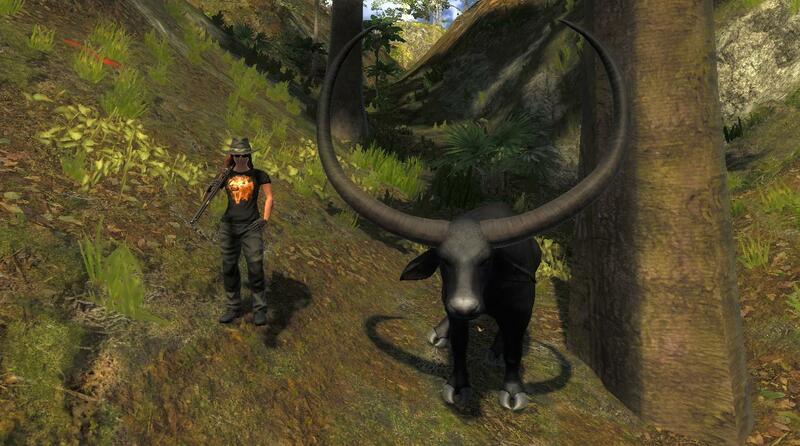 If you are not sure what many consider a trophy Water Buffalo, it is any that score over the 250 mark! The ‘Rare of the Week’ goes to ‘TriRap02’ for this Piebald Roe Deer. With a score of 194.143, Congratulations! A very nice Trophy shot. This week Red Fox and Arctic Fox are free to hunt, good luck! The daylight hours here in Sweden are rapidly dwindling by the day. The mist, rain and clouds are settling in for the impending Winter, which will see them convert into hail, sleet and then snow. But as many know, this is a good time to be out in the wilderness as many huntable species are more active and vocal. This weeks video is actually the start of a series that was suggested to me by community member ‘DaveyCockett’ and I am really enjoying it so far! Remember these show real hunting footage, so if you prefer to keep your hunting fix virtual, DO NOT CLICK Here. 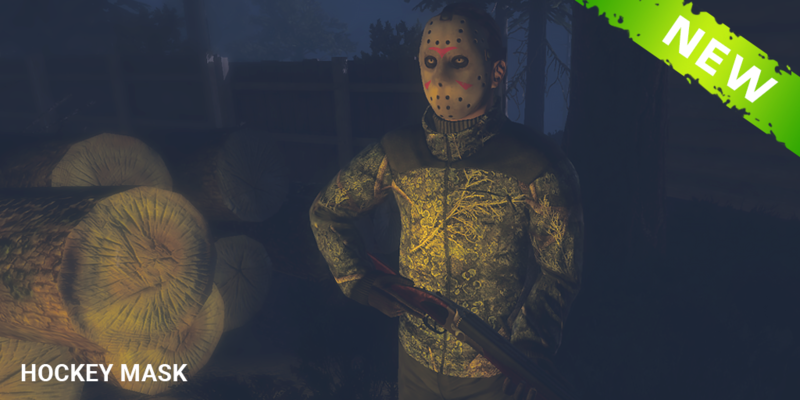 Yesterday we wrapped this years Halloween Event up and all indicators so far show that it was a very good event and enjoyed by a lot of hunters. We have put together a survey so we can gauge the event and use the information you provide to us, to continue to make improvements and make next year even better! To participate in the Survey all you need is a Google account, which are free and easy to setup and to Click this link. 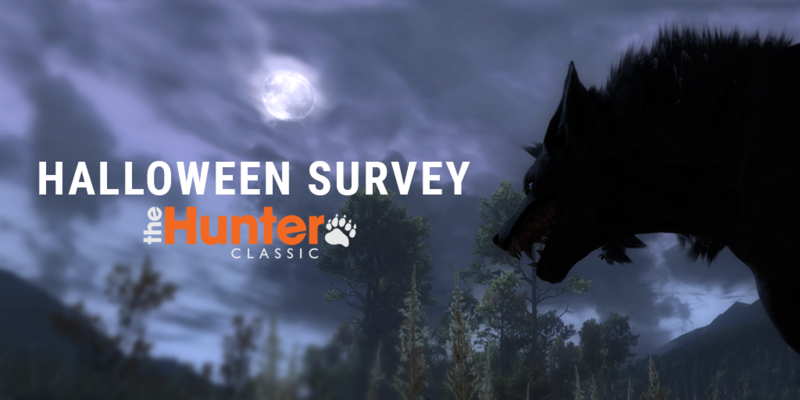 On behalf of the whole team here at theHunter: Classic, I would like to thank everyone who participated in the event and offer our congratulations if you placed in a competition, finished the mission pack or bagged a Werewolf! In December we have our next ‘Advanced Firearm’ coming out, ‘The Scout’. This rifle will feature a folding bipod that is built into the front of the stock and deploys when the player goes prone. While prone it will provide extra stability, but to balance that out and add to the realism, the side to side movement will be a little more restricted. 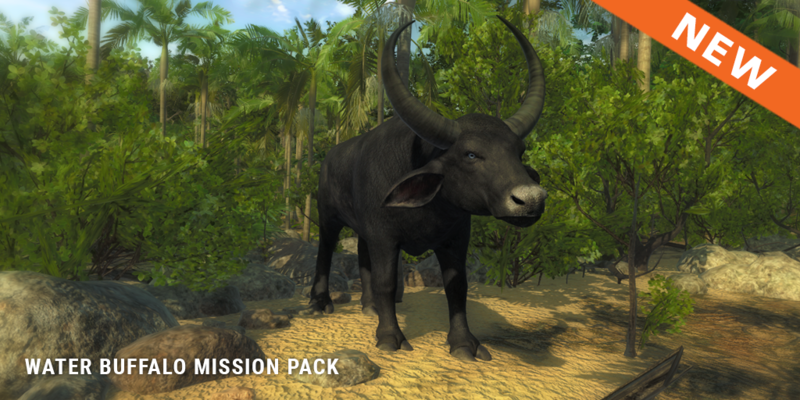 Today, Water Buffalo missions have gone live and everyone can try their luck! The pack offers a good challenge and Water Buffalo being Water Buffalo, I am sure there will be some laughs… especially if you are not the one getting run over! To find the missions, click this link and then scroll all the way down to the bottom of the page. Good luck! Wowsa… it’s November already! If you have played the game for awhile, you will know that this is the month, when the Mustaches become purchasable! So if you missed out last year, or perhaps you feel like wearing a new style this year, just head to our store page and pick one up! It is worth noting that a few years ago we donated some of the profits to a charity, this year this will not happen. Unfortunately next week (15th Nov), we have a company wide meeting and to line it up with the New York office’s timezone, it runs through our scheduled streaming time. It is a compulsory meeting and we will not be able to put a show on! Which is a shame as I look forward to the weekly catch up with you all, we have a lot of regular viewers now and the banter is top notch! I guess I should try work out an extra special one, for the following Thursday! The ‘Trophy of the Week’ is this HUGE Feral Pig! It was shot by ‘Rugged_Randy’ and scored 1176.4! If you are not sure what many consider a trophy Feral Pig, it is any that score over the 1000 mark. Congrats Rugged_Randy! 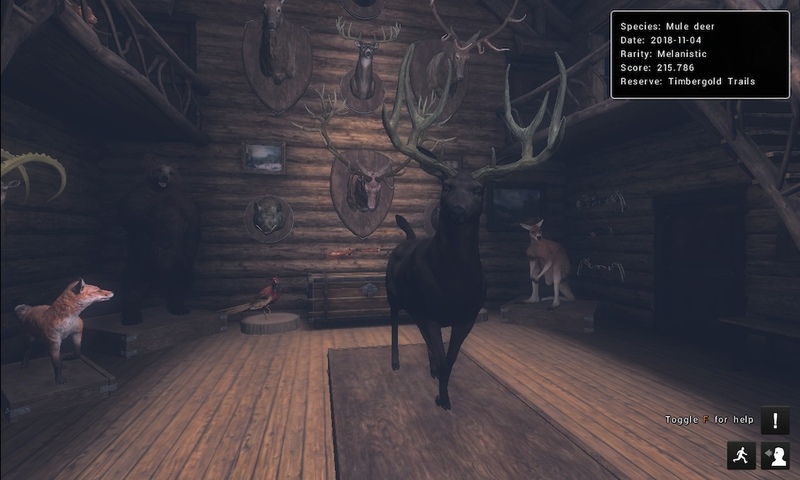 The ‘Rare of the Week’ goes to ‘Nathan112244’ for this Melanistic Mule Deer. With a score of 215.786, it qualifies for the Super Rare Gallery. Congratulations! I know you shot it through the Halloween event, it must have been hard to see! 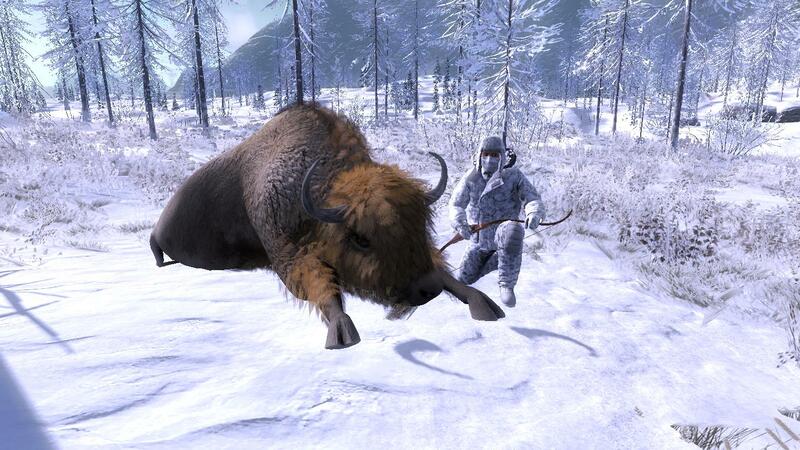 This week Water Buffalo and Canada Goose are free to hunt, good luck! Both myself and Graham have just got back into the office, the jet lag is real, so I hope the Status Update makes sense this week! Now I was not here to post last weeks Status Update and I see for some reason the link did not change, for that I am sorry. But here is the Alaskan hunt from last week, this time with the correct link! The video this week is much more showy than last weeks, but they manage to get some nice animals! Remember it shows real hunting footage, so if you prefer to keep your hunting fix virtual, DO NOT CLICK Here. 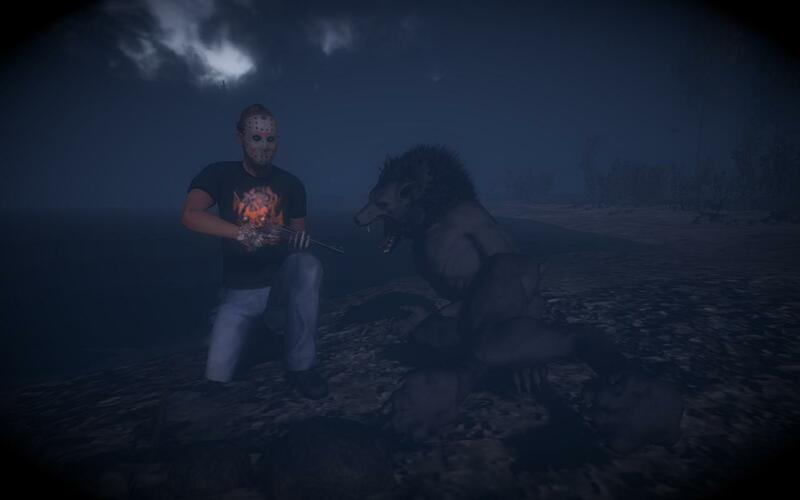 I hope everyone is enjoying this years Halloween event! Social media is absolutely full of great photos and trophy shots! 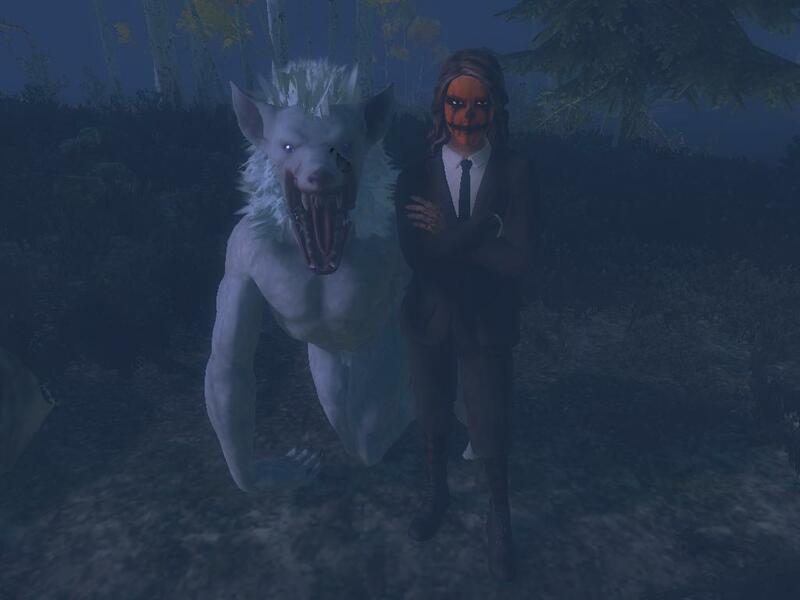 Remember the missions and competitions stop this Friday, but the Werewolf will be huntable till early Monday morning, so make sure you don’t miss your chance to participate in this fun event! 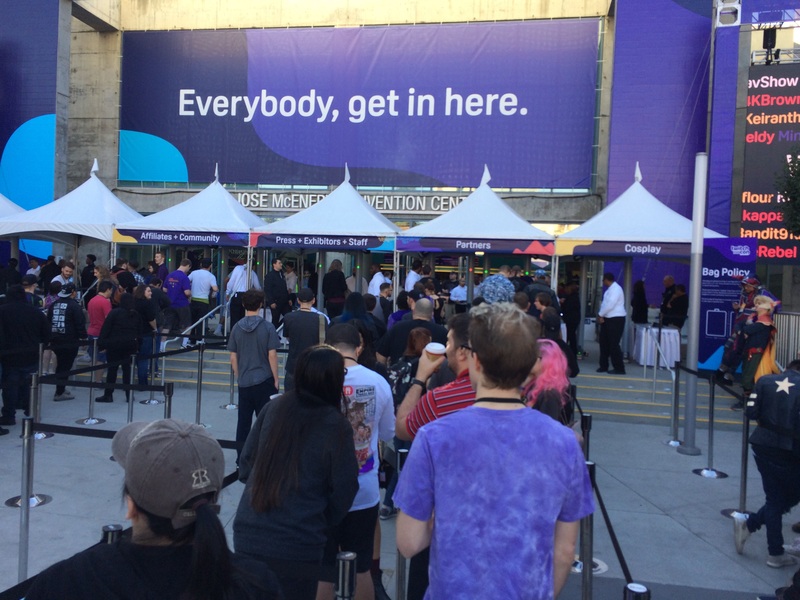 Last week Graham and myself ventured to Twitchcon, which was in San Jose, California, USA. Twitchcon was amazing and had us busy for 4 days of workshops, networking and checking out how other companies in the industry were doing things. We were sent there to represent Avalanche Studios as a whole, and not so much ‘theHunter’ franchise, however both classic and COTW got talked about many times. As it was my first time in the states, in the limited spare time we did have, I wanted to make sure I tried to do and see some stereotypical American things. 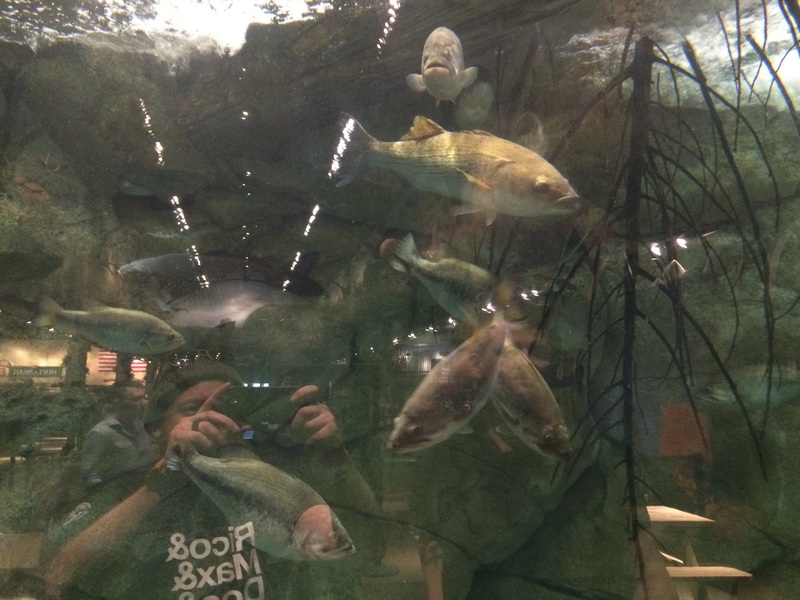 We visited a Denny’s for breakfast, a Target and a Walmart just for the ‘Wow’ factor. Ate fried chicken wings, had some Panda express, ate at a burger bar and had some American pizza. While a lot of you American readers will probably be laughing or perhaps shaking your head at what you just read. For a lad growing up in little old New Zealand, these are the things we see and hear about in the media and personally seeing and doing it all was just ticking some fun boxes. Next time I come over I hope to be able to see some of the amazing scenery and maybe even get some hunting in! 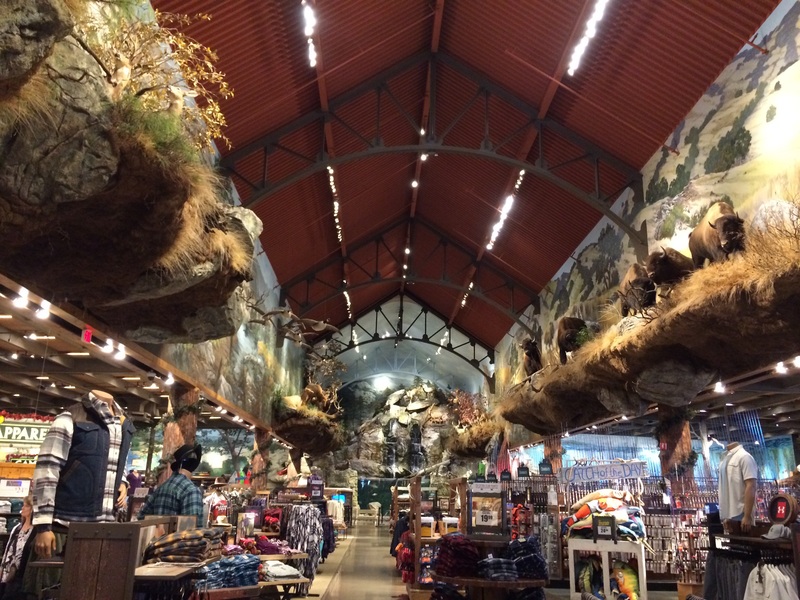 I think by far the two most impressive things we did and saw was the Bass Pro Shop and going to a shop that specialised in Archery, we were so impressed with the latter that both Graham and I purchased a Compound Bow each! The entrance way, all those are real antlers! Once inside, the true size of the shop hits you. 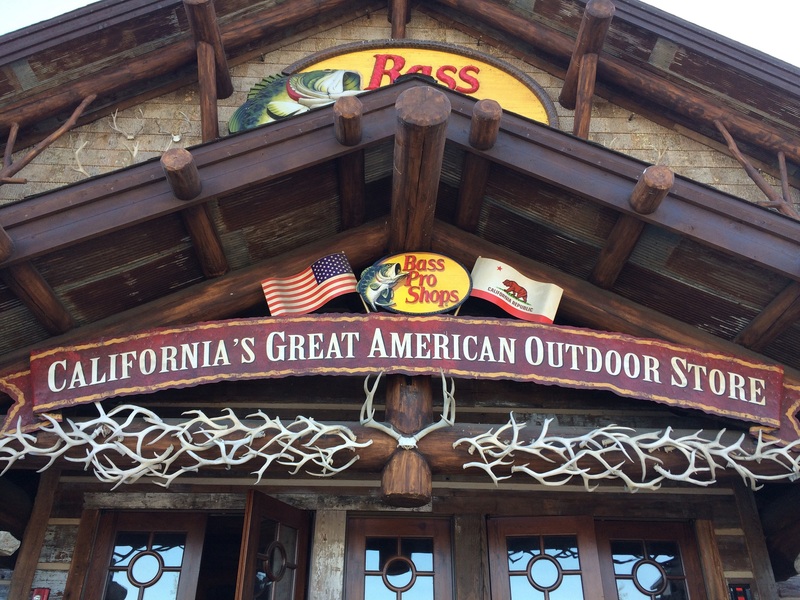 All guns and Bows must be checked in before proceeding through the gates. The hallway is at a guess over 100m long and filled with dioramas that all have real animals in them. Many were shot, but a lot have been taxidermied after being hit by cars as well. It even has an aquarium in it. 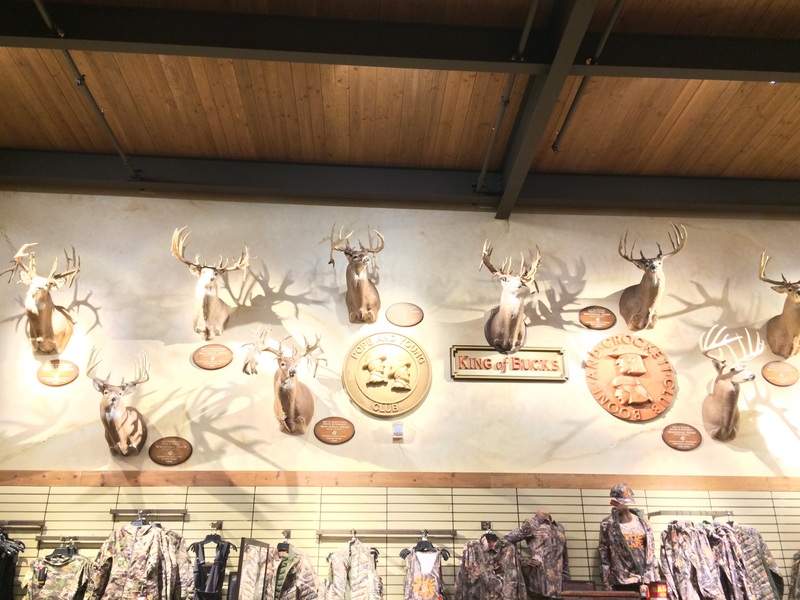 Sorry for the photo quality, but this is their Boon and Crockett wall of fame. These are all Whitetails and none of them scored under 200. 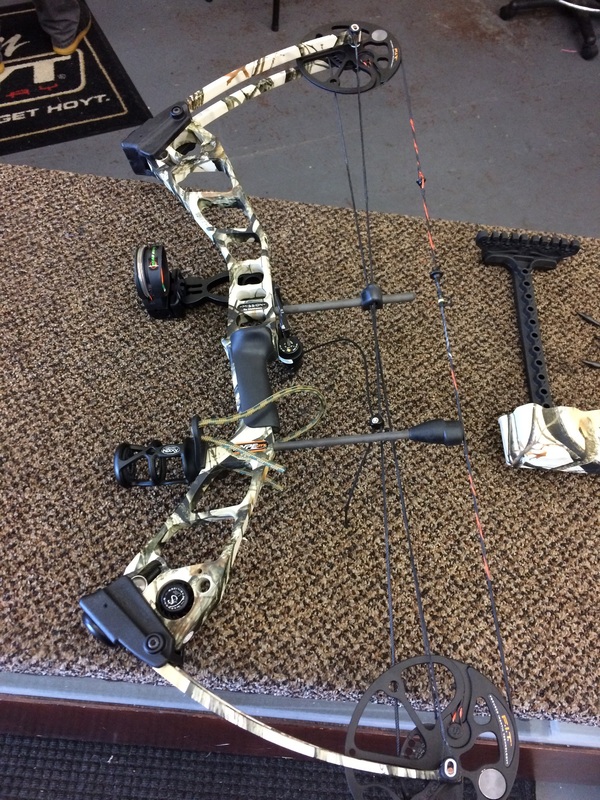 Just to wrap up the bows quickly, I purchased a Mission Hype DTX in the end, I originally was going to buy a Diamond Edge SB-1, but they convinced me to put a little more money in and pick up this nice bow. I got it setup with a 60lb draw weight and it feels like nothing, absolutely amazing! I even managed to split my first arrow and as satisfying as it was, I quickly realised that it gets expensive. Both arrows fused themselves together and I am now down to 10 arrows. 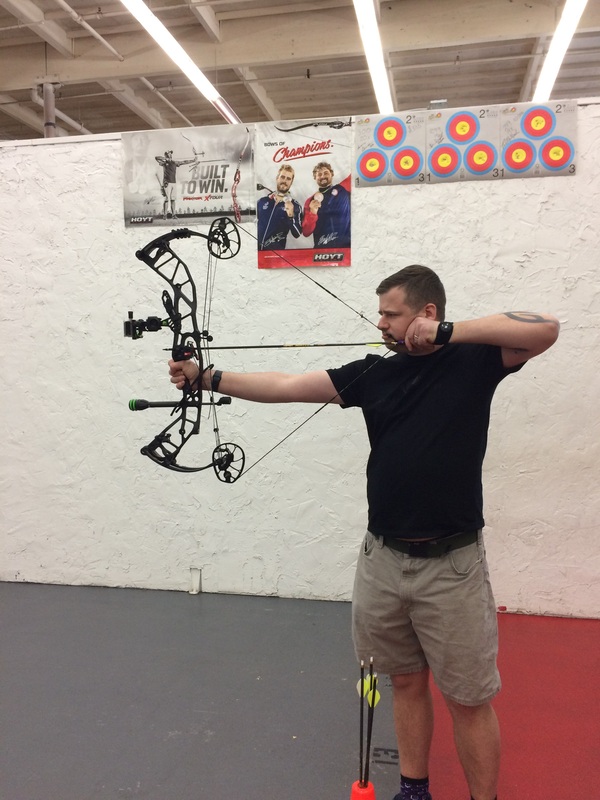 Graham got himself a very nice (lefty) Hoyt Hyper Force and is also loving it! It’s safe to say we both have a lot to practice and work on, but we are loving it so far. 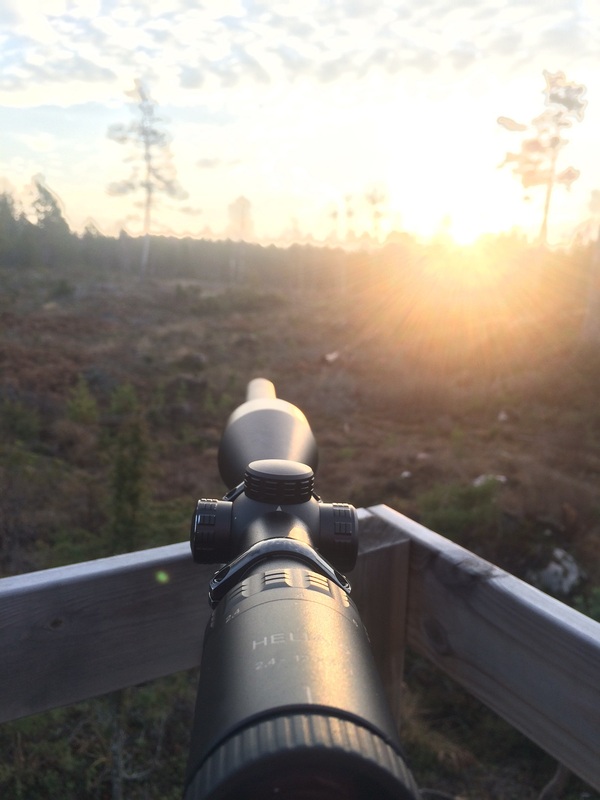 Next year bow hunting is supposed to become legal in Sweden, so fingers crossed! We have shot over the 3000 member mark and the member count continues to rise nicely. Starting today for 24hours, there are some nice prizes being raffled off, but you must be in the server to win. All you have to do to join up, is click here! The ‘Trophy of the Week’ is this nice Werewolf!! It was shot by ‘Riumma’ and scored 382.811! Spooky Trophy shot! The ‘Rare of the Week’ goes to ‘Allyson Aragão’ for this Albino Werewolf, with a nice score of 267.945. A very nice trophy shot, it captures the spirit of the competition well, congrats! 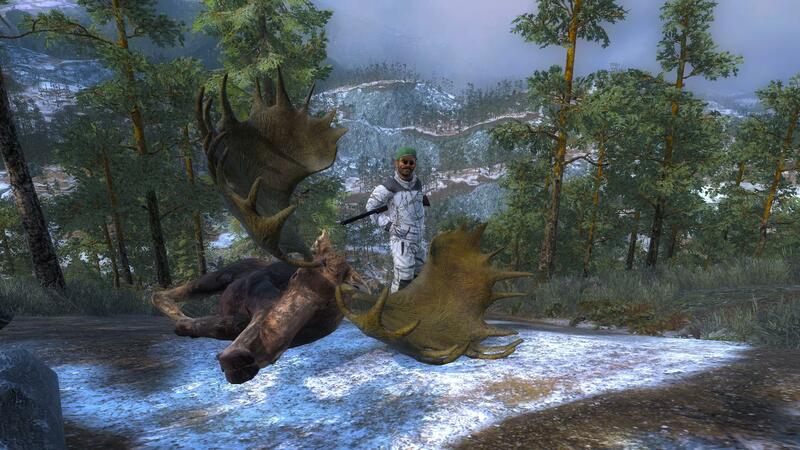 This week Grey Wolf, Roosevelt Elk and Werewolf are free to hunt, good luck! Please find below, the notes from today’s game update. Hockey Mask – Spooky Edition. Added Halloween mission pack (Rewards the .308 “Wolfsbane” Handgun and Silver Bullets). Brought out Halloween T-Shirt and Halloween face paint from Doc’s Shed. Fix frozen mouse issue some players experienced at high FPS. Fixed missing stone supports for hunting lodge. Centered the ironsights on .270 and .300 bolt action rifles. Updated the keybinding string for “Show Minigames” to “Show Huntermate Apps”. How is everyone this week? Have you been doing your prep for Halloween? This week’s real life hunting video is a nice Alaskan hunt, using a rifle. This video is much more showy than last weeks, but they manage to get some nice animals! Remember it shows real hunting footage, so if you prefer to keep your hunting fix virtual, DO NOT CLICK Here. BOO! That’s right, Halloween 2018 is now underway! 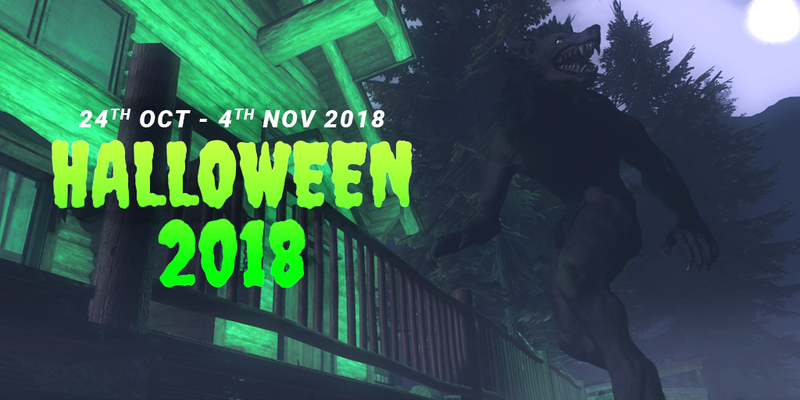 The whole event and Werewolf will be huntable until Sunday November the 4th, so make some room in your Trophy Lodge and head into Timbergold Trails for a truly spooky experience! This year we have a new mission pack and if you complete it, not only will you get a nice Trophy and a pile of gm$, you will also unlock this awesome .308 ‘Wolfsbane’ and a pack of silver bullets! If missions are not your thing, the .308 ‘Wolfsbane’ will be available for purchase in store as a premium weapon. This year we have exchanged the pumpkins for these amazing skulls! 1st Place: Trophy, 12 Months membership and ‘Wolfsbane’ Crossbow pistol. 2nd Place: Trophy, 6 Months membership and ‘Wolfsbane’ Crossbow pistol. 3rd Place: Trophy, 3 Months membership and ‘Wolfsbane’ Crossbow pistol. 4-10th Place: Trophy and 700em$. Anyone who gets over 666 Skull$: Hunting Tower (Bare Wood), Halloween Face Paint and one pack of Silver bullets. A new competition starts every two days. Each competition only lasts two days except for the competition “Werewolf Slayer” which is active until the campaign ends. Most competitions only have 5 attempts, one only has 3. This has been done to try and address feedback about making the competitions more fair for casual players. For those who like to dress up for Halloween, we have this awesome ‘Hockey Mask’ that is sure to make for some great trophy shots! This as well as last years t-shirt will available in store for purchase. There was more information in the last Status Update and that can be found here. 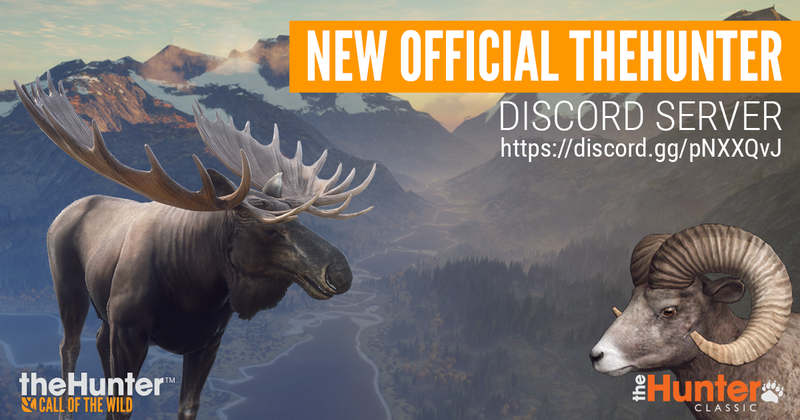 We are already nearly at 3000 members in the Discord now and when we do hit that magical 3000 mark we will be doing raffles to give away t-shirts and in game prizes. You have to be part of the Discord to participate. All you have to do to join up, is click here! Scope and zooming issues: We are now happy with the fix we have for this and it has gone out in today’s Halloween patch. For a week from today (Wednesday), Graham and myself will be at Twitchcon in San Jose. So if you are going to the convention, keep a lookout for us and make sure you come say hi! The first ‘Trophy of the Week’ is this nice Moose!! It was shot by ‘Violator31’ and scored 212.079! I thought the unique pose and trophy shot was nice! 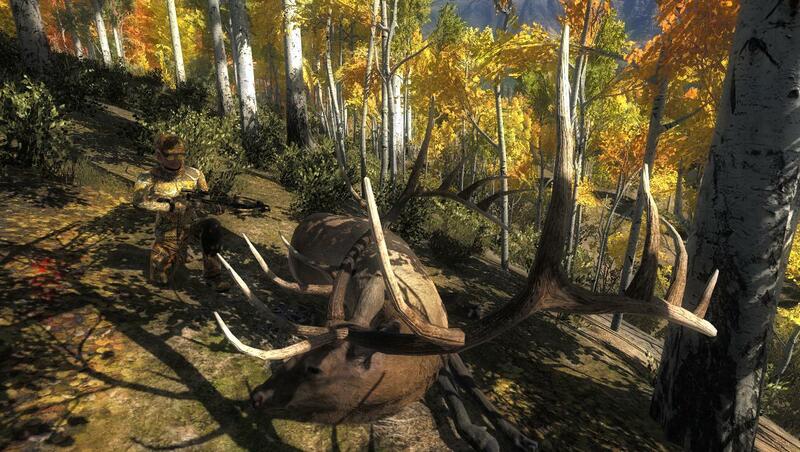 If you are wondering what many consider a trophy Moose, it is anything over the 200 scoring mark. The Second ‘Trophy of the Week’ is this great Red Deer!! It was shot by ‘StrongBeaver’ and scored 273.152! A very nice trophy shot. 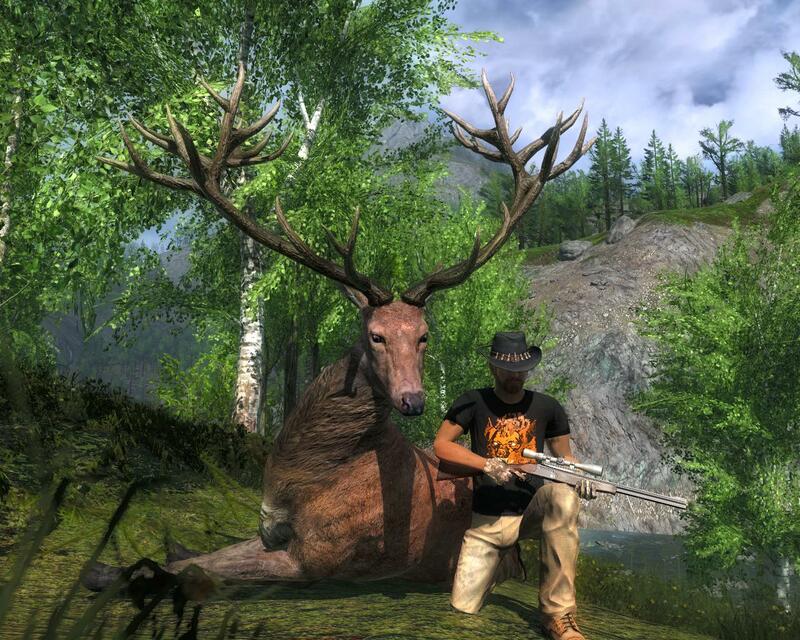 If you are wondering what many consider a trophy Red Deer, it is anything over the 250 scoring mark. 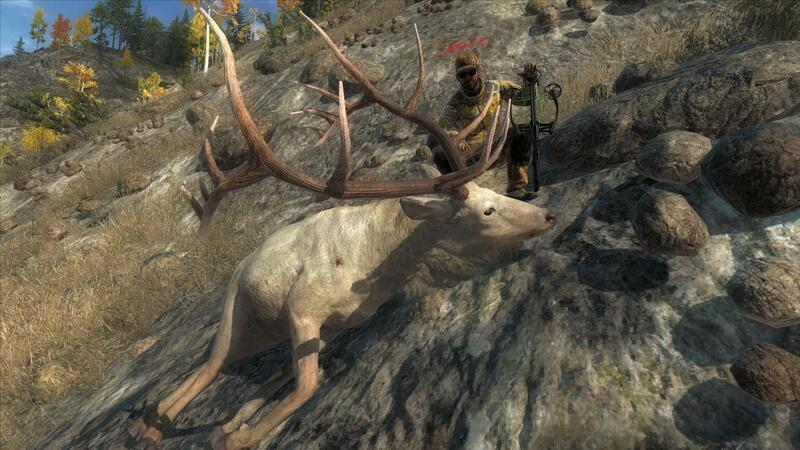 The first ‘Rare of the Week’ goes to ‘InstinctiveArcher’ for this Albino Bison, with a nice score of 113.367, Congrats! 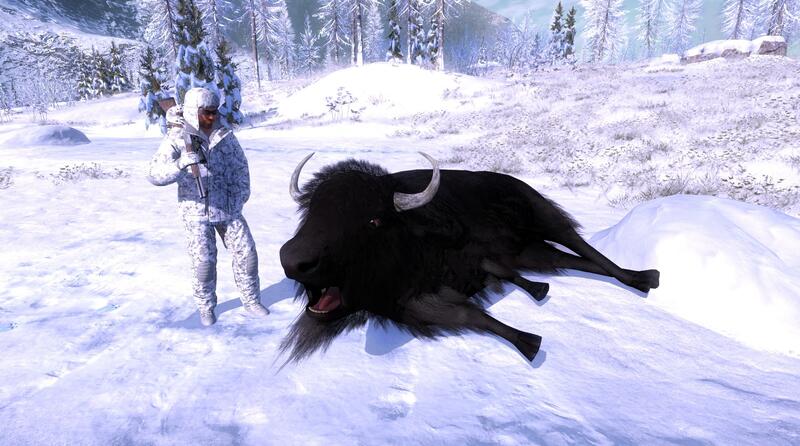 The second ‘Rare of the Week’ goes to ‘Scrubje’ for this Melanistic Bison, it also had a nice score and just slipped into the Super Rares Gallery! 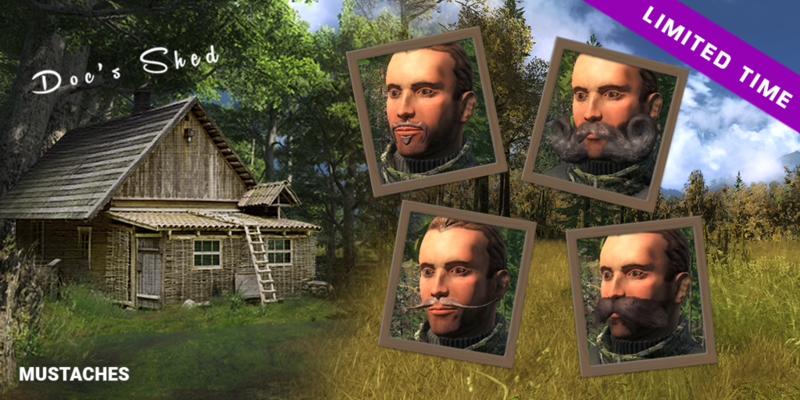 This week Werewolf, Alpine Ibex and Feral Goat are free to hunt, good luck!